Off the Beaten Path: There's Gold in Them Thar Pages! There's Gold in Them Thar Pages! When I was a girl growing up in a small town outside of Atlanta, my family would take an annual trip to the North Georgia mountains each fall. Those Saturday or weekend-long trips would include three essentials: buying apples for the applesauce and fresh apple cakes my mom would later make, eating boiled peanuts from a paper bag (now you know how deep my Georgia roots go!) 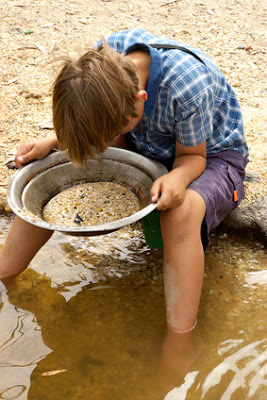 and panning for gold. I still have a small vial of that precious North Georgia gold, although the little glass container holds more water and red Georgia clay than it does flakes of gold. Truth is, we probably didn't pan for gold every time we journeyed through the North Georgia mountains, but at least occasionally my dad paid the couple of dollars for my brother and me to receive a large "pie pan" already amply filled with dirt so that we could shake it back and forth in the little trough of water and try to spy a tiny bit of gold. 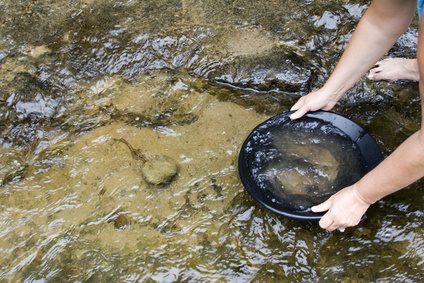 Later, as a middle schooler, I went on a school trip to North Georgia and we actually had to fill our own mining pan with dirt from the creek bed and pan for gold squatting down by the running water. This was probably a little closer to a more authentic replication of the hungry miners' search for gold. But I undoubtedly was too preoccupied with flirting with some middle school boy to give the chore much concentration or effort. At any rate, I never got rich panning for gold in the North Georgia mountains. But there was gold in them thar hills, all the same. Gold was discovered in Dahlonega, Georgia, in 1828, sparking the first major gold rush in the United States in 1829. In fact, so much gold was found in this area of North Georgia, that in 1838 the United States Mint opened a branch mint there which produced only gold coins. When gold was found in California in 1849, standing atop the steps of the Lumpkin County Courthouse in Dahlonega, mint assayer M.F.Stephenson begged miners to stay in Dahlonega instead of heading west, saying "There's millions in it!" But with time, as is often the way with words, that famous plea morphed into, "There's gold in them thar hills!" yes, than much fine gold. Yes, I have found that the teachings and wisdom and direction and revelation found in the pages of God's Word are indeed more desirable than even all the gold ever mined from the rich dirt of North Georgia. I bet you've found that to be true in your life as well. God's Word has pointed the way when we felt lost. It has provided an anchor of hope when we were tossed about in the waves of despair. It has turned our gaze to eternal things of great value when we became mired in the sticky matters of the temporal. It has promised us peace and joy and rest when we felt anxious and tired. And it has grounded us in truth when the world insisted on floating with the whims of wishful thinking and silly philosophies. But even though we have found the substance of the Bible to be worth so much, do we passionately mine for it the way the hungry gold miners of the early 1800s hunted for little hidden pockets of gold in them thar hills, even though their ventures were speculative at best? Do you take time with reading the Bible, mulling over its teachings and allowing the Holy Spirit to guide you into deeper stores of truth than you had previously unearthed? Do you handle the Scriptures with careful precision, cautious to preserve its integrity and not spoil its value by unnecessarily parsing it to pieces? Do you invest time and effort and even your money in your pursuit of Godly wisdom and truth? Or do you relegate it to the position of hobby, after thought or if-I-don't-have-anything-better-to-do? Do you study portions of the Bible, a little at a time, mining it for hidden treasures only available to those willing to put in the work? Do you join others in your pursuit of this treasure by being a part of a Bible study group, a mining party, if you will? I fear that many of us put about as much effort and time and resources into unearthing the treasures of God's Word as I put into panning for gold on those autumn Saturdays spent in Dahlonega so many years ago. It's a novelty, a fun diversion, a trivial pursuit. This fall, as Bible study season once again kicks off, let's mine the riches of God's Word with a little more fervor than a middle school girl crouching by the creek with one eye on her dirt-filled pan and one on some cute 7th grade boy. Let's dig and chisel and search like our lives depend on what lies deep beneath the surface. Because, after all, folks, there's gold in them thar pages! Are you planning on participating in a group Bible study this fall? Where and what will you be studying? Nosey Kay wants to know!